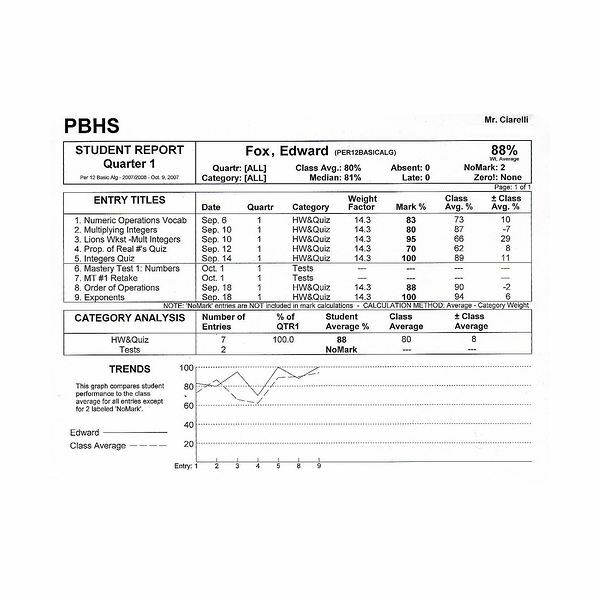 Progress reports are not just for the parents. If one parent is schooling the child while the other is working a full time job, then it may be useful to the parent who is working full-time. Still, there is a greater benefit when a progress report is created for the student. The student will be able to identify areas that need more work. The student will also begin to see a pattern in areas of excellence. A parent will want to take note of this and encourage the student to research a career in those areas. Progress reports should be created in between each marking period (or semester). There are four marking periods in elementary school and high school. So you will have four progress reports and four report cards. Since each marking period is two and a half months long, the progress reports should be every one month and seven days after the last report card. This also gives students enough time to improve their grades before the report cards are due to come out. The report card stays on a child’s permanent record whereas the progress reports do not. Use the computer or create the progress report by hand. Write or type each subject in a column and leave a row for a check, check-plus, or a minus. Create four columns, one for each marking period. Next take a look at the student’s grades in each subject. If he or she has an A average, then you will issue a check-plus. If he or she has a B or a high-C average, then you will issue a check. If the student is getting a low C or lower in a subject area, then issue a minus. Leave some lines at the bottom of the progress report so you can write notes to the student. Let him or her know the reason that he or she earned a minus and how to improve. If he or she earned all check-pluses, then reward with praise for a job well done at school.